CMST assistant estimator Liliana Almonte; and NAWIC Boston chapter president Carlie Biron. The breakfast commenced with remarks from the firm’s CEO, Les Hiscoe, and the president of NAWIC Boston, Carlie Biron. 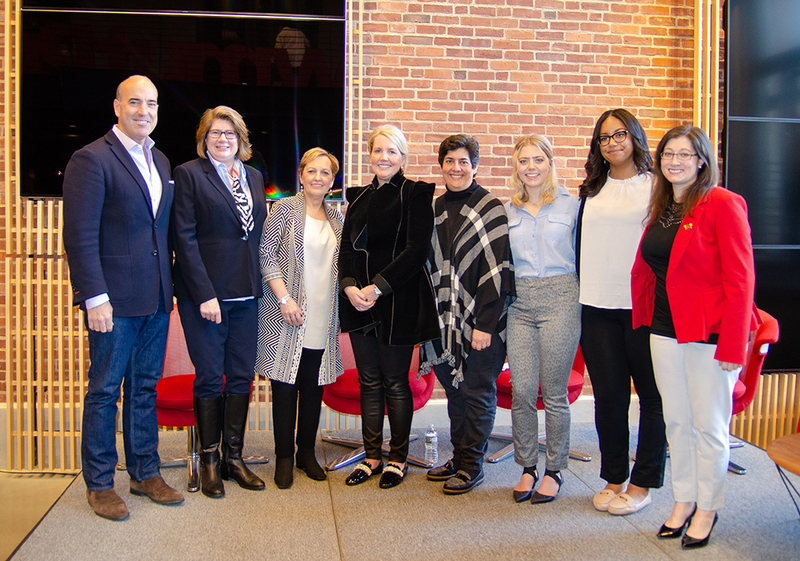 Additional highlights of the morning included panel discussions about career development and advancing women within the industry with Shawmut’s vice president, Sharon Cadman; chief people officer, Marianne Monte; chief marketing and strategy officer, Emma van Rooyen; and Shawmut board member, Kim Bishop. The breakfast event marked the conclusion of National Women in Construction Week, which occurred March 4-9, 2019. In addition to today’s event, Shawmut honored and recognized the achievements of female industry employees through a variety of special activations across their offices nationwide. The firm profiled leading women throughout the organization, and coordinated tours of women-led projects, including Billerica Memorial High School in Massachusetts and Park Avenue Synagogue in New York. Special panels were held at Shawmut’s NYC office led by key female leaders, including Chelsea LeMar, executive director of Professional Women in Construction; Geri Gregor, COO of Reliance Mechanical; and Luisa Herrera, deputy manager for construction, The Metropolitan Museum of Art. Shawmut West hosted a panel in the Los Angeles office, featuring Severine Tatangelo, principal and founder of Studio PCH; Zeynep Ozandag, director of store planning and development at Louis Vuitton; Lori Treboldi, director of construction at Wynn Design & Development; and Danielle Edberg, senior manager of industry advancement at Procore Technologies. Shawmut employees and guests also worked to raise funds and donations for Dress for Success, a worldwide charity aiming to empower women to achieve economic independence by providing a network of support, professional attire, and development tools to help women thrive both professionally and personally.